Honestly, you give people something for nothing and are they grateful? No, they just complain when you stop! For the last year and more, we've been running a free-to-enter competition to win a gun - typically worth about £1000 - every month in the magazine. It helps promote the magazine and in modern marketing terms it's "added value" for the readers. But the magazine is a business like any other, and we can't just keep giving away a free gun every month. Could your local gunshop afford to do that and stay in business? Neither can we. So we had two options: ditch the competition altogether, or charge a nominal amount for entry - not to make a huge profit (fat chance!) but to offset some of the cost of the gun... before the managing director hauls me up in front of the board to explain why I'm throwing their money away! And I thought, well, I'm sure readers would rather have the choice of entering if they want to. And if they don't want to spend a quid or two on an entry, no-one is forcing them. Well, blow me if I don't get an earful from an irate reader accusing me of killing off the sport of shooting single-handed! And then another reader calls to accuse me of making obscene profits from a phone-in scam! So listen up: if you don't want to enter, don't enter; if you do enter, I wish you the very best - but either way the sport of shooting will continue regardless, and I won't be retiring to the Bahamas on the proceeds! As our esteemed government insists on treating us all as five-year-olds, even a perfectly innocent stalker, keeper or countryman can get his collar felt for carrying a knife these days. Personally, I've had a knife and a length of string in my pocket since I was at school. It's a part of me. I feel naked without it. It's invaluable umpteen times a day, for innumerable little jobs. And since my ancestors (and yours) used knives to fight wild beasts and marauding tribes, hacked down trees and harvested crops to make this country what it is, I'm blowed if some jumped-up do-gooding numpty is going to tell me I can't be trusted with a pointy thing any more. Having said all that, I'd rather not have to explain it to the magistrate, with all the bother and expense that would involve, not to mention the difficulty next time my firearms certificate comes up for renewal. Oh, and if you ever find yourself in that position, think very hard indeed before accepting the apparently easy way out of a 'police caution'. That is basically an admission of guilt, and will cause you all kinds of bother in the future. So now I'm carrying this rather smart - and very practical - little Spyderco knife that's been designed precisely to fall outside the latest nanny-state knife laws. It has a blade of (just) under 3ins, and it folds. It doesn't lock - although it does open with a very positive click. In normal use, your forefinger blocks it from folding onto your hand, so it's almost as safe to use as a lock-knife. And if PC Plod makes a fuss, I'll refer him to the Criminal Justice Act 1988, Section 139. The knife is available, price £69.95, from Heinnie Haynes; for more on the UK knife laws see this document at the BASC website. Today we've been at Braintree Shooting Ground in Essex, getting the photos for the next few articles in Mike Yardley's brilliant new 'Natural Shooting' series in the magazine. It's always fun spending a day on the clay ground with Mike - we work well together and we've become quite efficient at getting the photos we need in the bag. Rach was there helping out, and my daughter Emma (pictured above with Mike) came along too. After a frustrating time in the pigeon hide on Sunday, she was hoping to pick up some tips! Above is a brief video clip showing Mike putting his advice into action. We shot a few more clips where Mike explains some of the fundamentals of the Natural Shooting system. Once they're edited, we'll be putting them on the website. Meanwhile, here's a shot I was particularly pleased to get - not just because it shows the clay at the moment of breaking but if you look closely you can see the shot pattern passing through the spot where the clay was struck. 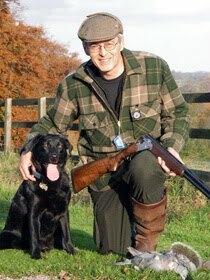 Just back from Liverpool, where I was pigeon shooting with John and Mark from decoying.co.uk. We were using their amazing new Air-Pro spinning-wing decoys, which flicker realistically in the breeze and certainly pulled in the birds from a long way off. Unfortunately I was a bit rubbish at hitting them, but you can't have everything! The new decoys are available now from www.decoying.co.uk for £49.99 per pair. I've just been to visit Charles Bull who runs justcartridges.com, near Oxford. We stood in his warehouse, stacked with over a million shells of every bore and shot size imaginable, and had an interesting chat about the price of cartridges, which has been rocketing this year - some say due to the demand for lead in China. Whatever the reason, it's causing concern for some shooters, particularly those who get through a good few shells each week. Charles doesn't think it's going to make a big difference to the number of people shooting, though. As he says, the cartridges are a tiny fraction of the cost for a game shooter. And even for clay shooters, the increase is relatively small in proportion to their investment in guns, clothing, membership fees and the like. For those who are looking to cut their costs, Charles offers this advice: "Cartridge manufacture is so high-tech these days that there really isn't such a thing as a bad shell. For most shooters, they won't notice the difference between a cartridge that costs £200 a thousand, and one that's £120 a thousand." So if you want to dent the cost of your shooting, buy cheaper shells. Simple. And guess what, Charles sells some! Check out his prices online at www.justcartridges.com. You might want to turn off the speakers on your computer first though, as the site has a maddening series of ricochets as the front page loads! What a great day! 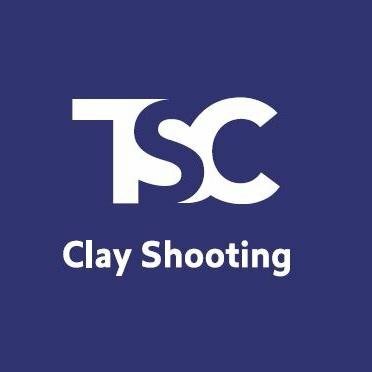 A group of 12 of us went clay shooting at West London Shooting School. Most of the group above work on some aspect of Sporting Shooter, at least part of the time - but most of them had little or no experience of shooting. Not any more! Under the expert guidance of WLSS's instructors, even the total beginners were soon hitting clays - and now they're hooked. Trouble is, they'll be nagging the MD to let them do it again soon. WLSS run a lot of these sort of days, and they do them very well. The staff are friendly and welcoming, and soon put everyone at their ease, even when their friends have been scaring them silly with stories about how the recoil will break their arms. The ground laid on a good lunch, and the instructors have an uncanny ability to melt into the background at just the right moment and let the group gel. I suppose I'm biased, but I reckon more companies should run days like these for their staff. I know it sounds trite, but it really does foster a great team spirit, and make everyone feel that bit more valued and special. I'm sure the cost of the day must be repaid many times over in productivity. Today I interviewed Chips Hardy, author of 'Each Day a Small Victory'. He came to the West London Shooting School, where we were doing a company clay day - and I led him a merry dance trying to find somewhere quiet enough to record an interview. We ended up doing the interview in my car, which seemed to be the only place where there weren't dogs barking, helicopters flying over, or people chatting loudly! It was fascinating to hear about his research for the book, and he told me about a curious incident that happened while he was writing it. It had been a while since he had done any work on the book, and one day he was driving along when a stoat ran into the road in front of him, stood up on its hind legs and chattered at him. Then it ran to the stone wall at the side of the road, and ran alongside the car, still chattering. Bearing in mind the central character of the book is a stoat, he took this as a sign that he should get on and finish writing it! I'll include my interview with Chips in the next podcast - watch this space! I've been reading a remarkable little book - 'Each Day a Small Victory' by Chips Hardy. It's a kind of cute animal tale with a twist - it ain't cute! Far from it. This is anthropomorphic nature red in tooth and claw, with a twist of black humour. The anti-hero of the book, Max, is a stoat whose only aim in life is to find his next meal, while avoiding becoming someone else's. In that sense, it's the most honest animal story I've ever come across, and it's a great read. Chips clearly knows his countryside very well indeed - there is plenty of detail about the various animal characters and their habits. Apparently he is a British Comedy Award winner, and has produced and written for TV and theatre. I'm planning to interview him shortly - should be fascinating! The book has some stunning illustrations (above) by Oscar Grillo, who has worked on Monsters Inc and Men in Black, among others. The publisher's blurb says this book spearheads a new genre in literature, which they're calling 'rural noir'. I suspect it could prove to be a one-off. Either way it's set to become a classic. Read it. Just don't give it to any sensitive young nieces or nephews unless you know what you're doing! 'Each Day a Small Victory' by Chips Hardy. Published by Can of Worms Press, hardback, £12.99. (See the comment on this post for a link to the publisher's website). The Sporting Shooter team is off to West London Shooting School next Thursday. It's a chance for some of the people who work in departments like marketing to find out what shooting is all about, and a bit of a 'team bonding' exercise, and... well, who needs excuses to go shooting! Should be a good day - I'll post here and let you know how it went. Shooting has been thrown into turmoil by the outbreak of FMD. Stalkers must operate under strict restrictions, if at all. Pest shooters are finding they're not welcome on farms terrified of what might happen next. And now it looks like Defra themselves are the source of the outbreak! We'll be covering this story in detail as it unfolds - and we need your help. How is your shooting affected? What do you think about the way the outbreak is being managed? Are the shooting organisations doing enough?